Every year I find myself with an excessive amount of garden zucchini. Zucchini is at it’s best and most tender when it’s picked small – maybe 6-8 inches long and not too fat. However, every year I also inevitably miss a zucchini (or three) that was hidden under leaves or went crazy over a hot weekend, causing it to end up the size of a cave man’s club. Whoops! Luckily, zucchinis of mammoth proportions are actually ideal for baking. While zucchini muffins/breads are delicious and I usually make multiple rounds of them, I like to play around with things like zucchini-fruit pie or this year’s Zucchini, Prosciutto & Goat Cheese Tartelettes. 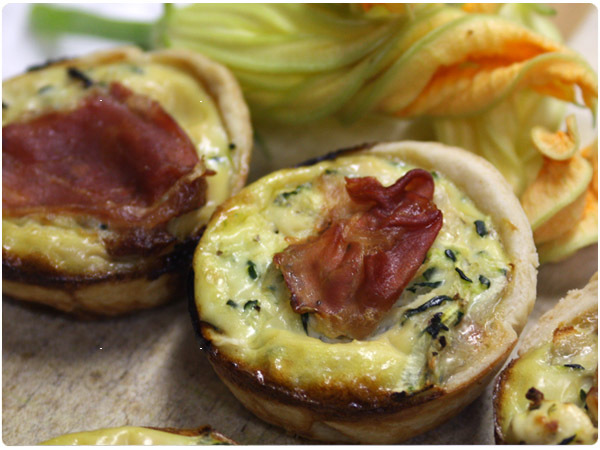 I served them as a side dish for dinner but these little lovelies would be excellent for breakfast, as an appetizer or at a bridal/baby shower brunch. You could also double the recipe and make them as a full-size tart for a main dish. Small zucchini will work in this recipe but if you have a large one the best way to deal with it is to slice off the ends and core out the tough, seedy middle. Next, use a food processor or cheese grater to shred the zucchini. Finally, measure out the desired amount of zucchini for your recipe and place in the center of a paper towel. 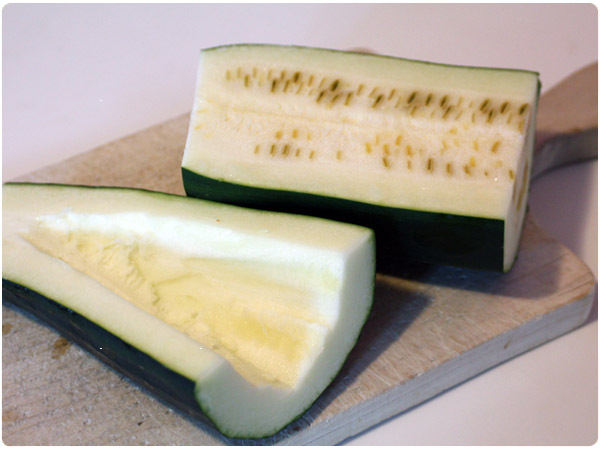 Carefully squeeze excess water out of the zucchini over the sink – this is key to not having soggy tartes or muffins! Preheat oven to 375. Grease 12 cups of a muffin tin. Prep pie crust (see instructions here) or roll out pre-made crust. Use a round medium-large cookie cutter to cut thin circles out of the pie dough and press each circle into a muffin cup. 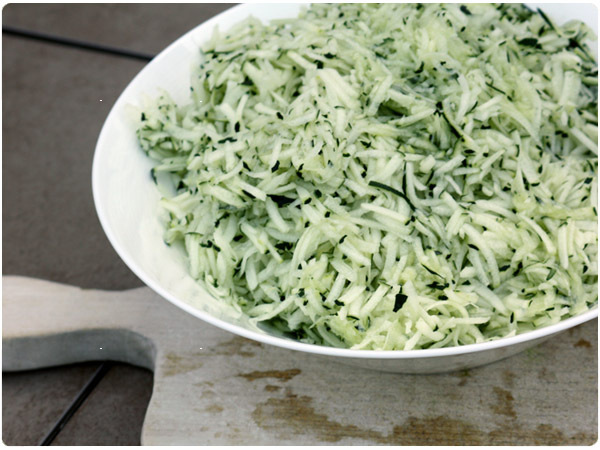 Core, shred and squeeze excess water from zucchini and transfer to a medium bowl. Mince shallot and add to bowl. Crumble in goat cheese. Slice 2/3 of your prosciutto into small pieces, and add to mixture. Reserve remaining prosciutto. Whisk in eggs, half and half, dill and salt & pepper. Spoon mixture into crusts, filling the tin about half-way full or just slightly above the edge of the crust. 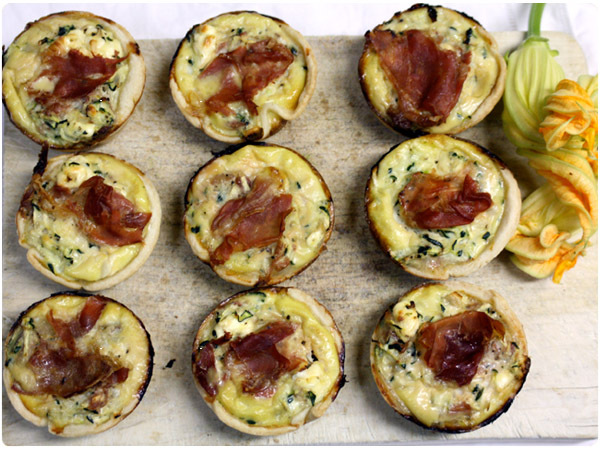 Tear small “squares” of remaining prosciutto and place on top of each tartelette. Bake for 40 minutes or until filling is puffed and slightly golden. Yum, I think I’ll make this for dinner tonight! Interesting. I hadn’t known that monster zucchini are best for baking applications. That’s good, since I have a bunch of monsters and am looking to bake them soon.